If a major personnel change is coming, be as open and transparent about it as possible. Let them know what will change and what will not so they will not be left wondering or unable to make decisions due to a lack of defined authority. When new managers and executives come in and roles are shifted, authority levels and responsibilities become unclear. The result can be employees who don’t move forward because they are unsure of whether they still can. Potential clashes from multiple employees or departments both thinking they can make a decision also contribute to the problem. Who must be informed? Who must be consulted, and who gets to decide depending on the issue or the amount of money involved? The more detailed these plans are the better the organization will be in the long run. 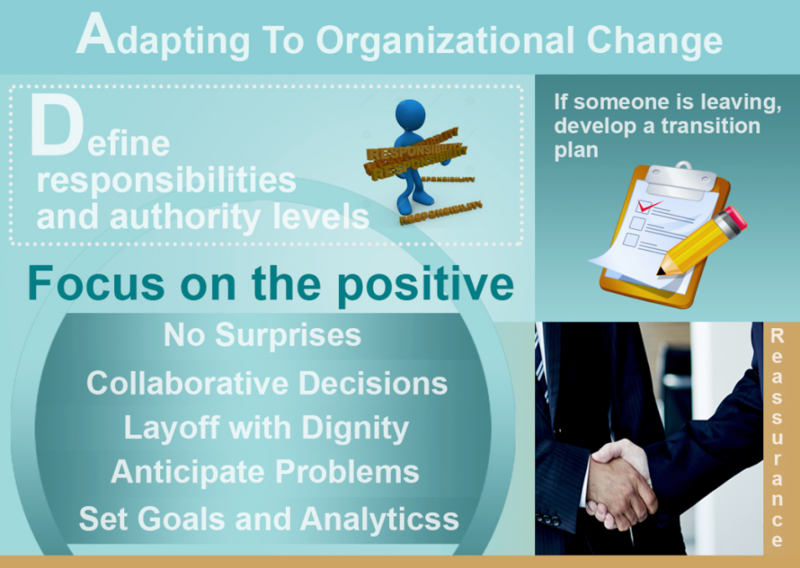 A transition plan allows you to define all the responsibilities of a current employee and how they will be handed off. This includes all their passwords, equipment, relationships, and areas of responsibility. Make sure cross-training starts before they leave and that those taking over feel completely comfortable moving forward. This may also lay out how their authority level might change during the crossover period. Simply speaking, you might not want them to make unilateral decisions during their final weeks. Being reassuring is key because many people tend to have doubts that can grow into full scale disengagement during a transition period. Let them know they are still valued and that although things are changing, the entire company will not be re-shuffled. Most organizations have unnecessary overhead and some mid-level management that can be absorbed, but it’s important during the process not to alienate those truly talented employees. They should be identified early on and made to feel that this an opportunity for them. Always focus on how a change will result in a better company, a better environment, and how it will personally benefit employees. For instance, a company that is acquired should celebrate the opportunity to be part of a bigger, stronger family, to have access to greater scale and potential. Even a layoff shouldn’t be all doom and gloom, but a necessary sacrifice and a call to action to fight for the existence of the company. It’s during those moments that most companies move into a whole new plane of existence. Even the world’s most valuable company, Apple, was once hurtling towards insolvency. It was at this moment that the company truly turned around. Give a rallying cry to fight for survival, to innovate, and work harder than ever. Unless your purpose in life is to give your employees a heart attack, give them enough information to see a particular organizational change coming. This allows them time to mentally prepare and also to feel that a decision was not made in haste. Let everyone know whose decision it was and all the parties involved. If multiple people were consulted in the decision, they should be included as it needs to be shown that the change was well thought of and involved at least consultation of trusted team members. Decisions made without collaboration can breed resentment. Even if people disagree with a change, they will be more supportive if they felt like they at least had the opportunity to be heard. Nothing speaks louder about the culture of your company and the way you treat your employees than the way you remove those people who you no longer need. If long-time loyal employees are kicked to the curb and led straight out of the office, that is an image and an atmosphere that will not soon be lived down. Try and be as humane as possible and accommodating, allowing employees a chance to go through a proper transition, having time to find a new job, and leaving on the best possible terms. Did you offer a severance package and favorable exit terms? Make sure to let your employees know it. The marketplace is full of former employees who went on to compete with their former employers. These are the people who know your designs, have client relationships and contact lists, and will be seeking gainful employment. There is nothing to gain by being abrupt in the process of kicking an employee out, but there is certainly a lot to lose. It’s much easier to anticipate problems and remedy them beforehand than deal with them once they have affected your organization. The key to finding potential problems is opening up communication with all employees as to what they expect, and actively soliciting any issues they might experience. No one knows better than them exactly what their job entails and what certain changes might mean for them. They are also best suited to recommend their own solutions. Having a set of metrics and goals helps set the organization towards developing itself to reach those heights. Not having a set of metrics will not only make people less motivated, but will also make it hard to tell if the organizational change was in fact a success. These metrics should not just be sales and profit but also reflect less tangible things like employee satisfaction, time to market, dealer satisfaction, and customer net promoter scores.